Their newest custom wiring system is built specifically for your Mopar Powered vehicle with all the connectors and wiring necessary to drive it, pass inspection, and be able to add accessories as you see fit, now and in the future. RF has included the cooling fan relay & wiring due to the fact that more and more customers are using electric fans. Now you can have everything centrally located for a cleaner installation! They've also added a Multi-Connection Battery Junction Block to reduce the number of wires going to the starter for all those add-ons in your custom Mopar powered application. 1) What is your vehicle model and year? 2) What is your engine? 3) Do you have a Dealer or Factory Electronic or Points Distributor? 4) Do you have a Stock or Aftermarket Column? If Aftermarket, what brand is it? 5) Do you have a Dash or Column Ignition? 6) Do you have a Column or Floor Dimmer? 7) Do you have a Mopar Original Externally Regulated or One-Wire Alternators? If you have an externally regulated alternator you will need to order a voltage regulator (part # VR-88). 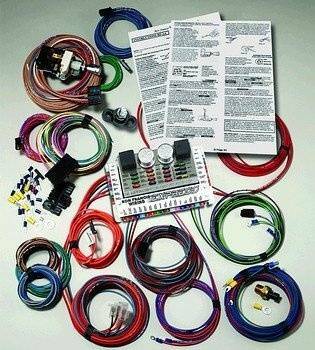 This is a very nice way to wire your classic Mopar! 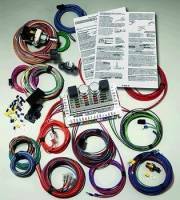 This kit will wire points, aftermarket and electronic (factory or dealer supplied) distributors. It also allows for connecting the Chrysler starter relay for use of the factory transmission-mounted neutral safety switch. Their printed and color-coded HIGH TEMPERATURE fire-resistant wiring is supplied for all circuits, including for the lighting needed for most safety inspections: Hi & Low beams, indicator lights, brake, turn signal, parking and third brake light. The EXPRESS has been improved over previous models to simplify and speed up installation, facilitated by RF's famous COLOR CODED INSTRUCTIONS. The kit includes a headlight switch, isolated cooling fan relay and a unique serial number that allows them to give technical support to you and any subsequent owner. 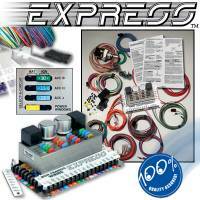 The Express is a direct replacement for all previous Ron Francis Wiring kits. It has a very similar bag structure to the past models. All variations of alternator, distributor and steering column are available.